Flux Destiny takes place in a universe where Destiny itself is a visible, controllable force. FLUX DESTINY follows 18-year-old Marco Mendoza, a cocky yet extremely talented University Academy student who has big plans for his life. He dreams of becoming the world’s greatest Storyteller. Storytellers are master designers who manipulate the fabric of space-time to create self-contained realities called Flux Destinies. The vast empire of Fortuna is suffering from ruptures. These tears in space-time expose the Great Machine - a gigantic ocean of gears, sprockets, pinions, and springs that forms the backbone of the universe. Left unfixed, these ruptures threaten to tear apart reality itself! Storytellers use Flux Destinies to patch over these ruptures with spectacular results. As a result, Fortuna exists in a world where fantasy and reality are interwoven through a series of Flux Destinies. Unfortunately, Marco’s dreams are dashed when he suffers a rare broken destiny. This tragic incident restricts his ability to create Flux Destinies. Marco is devastated and confused by this sudden change in his path. How could this happen to him? He was meant to be someone great! Disgraced and demoralized, Marco is suspended by the University Academy and forced to travel the vast country of Fortuna with a simple assignment: study and repair quirky yet seemingly benign rips in the universe called ruptures. To make matters worse, Marco is joined by fellow expelled student, 16-year-old Hugo Wandschneider. Marco’s relationship with Hugo is strained from the start, and he blames Hugo for his broken destiny. Hugo’s germophobia, juvenile pranks, and brazen attitude about Marco’s closely-held beliefs do nothing but irritate Marco and make their time together more miserable. Along with their assigned Clockbot, Lucky, Marco and Hugo set off on a journey that begins to yield strange results. Marco will do anything to repair his broken destiny. This leads to a deal with Hugo at the outset of the story: Hugo will help Marco fix his destiny and, in exchange, Marco will tear up the small green book that keeps Hugo’s bound to him. Marco and Hugo’s derailed futures force them to face questions as old as the World itself: who is actually pulling the strings of fate? It isn’t long before they become entangled in a complex, unwinding mystery that will expose so many truths that have been hidden for centuries. Now that you know the story, check out the Welcome New Reader! 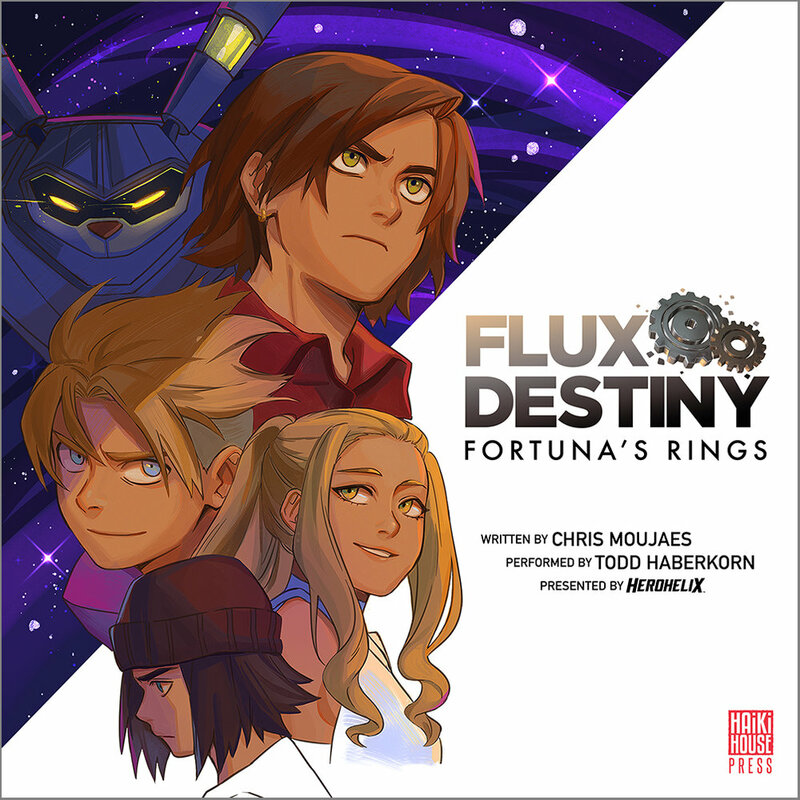 page to learn more about the Flux Destiny universe, books, community, and more!